Update: We've had another national newspaper review, this time under the title "The app that's a monster hit", in The Independent. With about a week and a half to go to release, Frankenstein has started to pop up in a few more places around the internet, and in print. 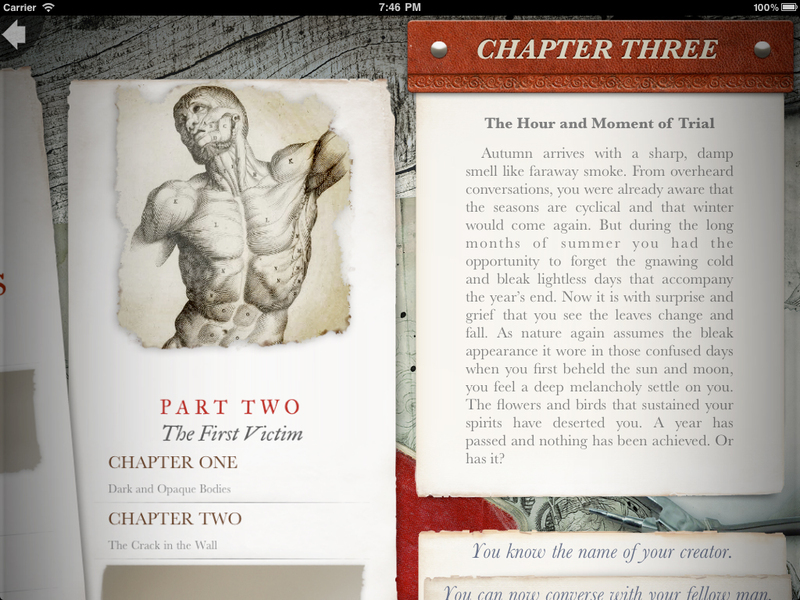 First up, a detailed interview with Good E-Reader, in which I discuss inkle and interactive apps, and Dave talks adapting the story of Frankenstein. Then there's a (slightly unexpected, but most welcome) half-review half-discussion of the Apple/DOJ court-case by Porter Anderson, as illustrated by inkle. Who, after all, makes an arbitrary spur-of-the-moment decision to kill in cold blood? "Would you like to strangle the boy? And do you want fries with that?" I was struck by how the issue of reader expectations and trust in the author and medium come into play. I wonder how many readers of the original Frankenstein dismissed it as "a tissue of horrible and disgusting absurdity", and so never stopped to consider its wide-ranging themes, or rebirth and humanity and self? There's been some discussion around this review already on Twitter, and we hope that continues once the app is out on the 26th.